It's been ten years since I was inducted to the joint-pastorate of Providence Baptist Church and Ebenezer Baptist Church. To mark the occasion our people laid on a special tea on Sunday afternoon. My wife told them that I didn't want any fuss, but they didn't listen. Deacons from both churches gave kind tributes and a lovely cream tea was served. Listening to the tributes seemed a bit like attending my own funeral, but in this case I was able to answer back and thank members and friends of the churches for all their love and support over the years. I was presented with a copy of The Christian Faith: A Systematic Theology for Pilgrims On the Way, by Michael Horton, Zondervan, 2011 and two, yes, two boxes of Milk Chocolate Brazils. 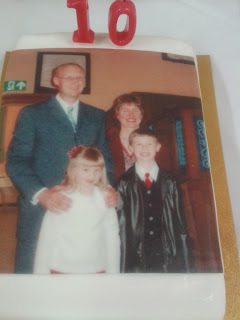 A cake with a picture of the Davies family taken at my induction at 2003 was a nice touch. I'm looking forward to getting my teeth into the volume of systematic theology once I've finally finished Herman Bavinck's Reformed Dogmatics Volume 4, which won't be until the New Year the way things are going. The chocolates will be consumed a little more quickly, however. Mention was made that both fellowships are now much more engaged in the local community, with outreach initiatives of various kinds having begun since I started. Opportunities to serve in unexpected ways have opened up, including writing, radio work, speaking at the occasional conference and becoming Chair of Governors at the local secondary school. I didn't realise it until Andrew Stone, a Providence deacon mentioned it that over the period of ten years I've preached through or led Bible Studies on around a third of the Bible. At that rate if I carry on here for another twenty I will worked though the whole lot. When a man moves from place to place, especially if he does that a number of times, then obviously his time is going to be taken up each time with the move, with getting to know his situation – the congregation, the community, his living situation. Time spent on this is time that cannot be spent on other things. You learn your trade. You learn from the lectures you received in theological seminary. You learn from hearing men speak on these themes at conferences. You learn from sitting under the best ministry. You learn from books and from the web, from whatever sermon series are contained there. There are finally appearing in the public domain through all these media examples of fine consecutive preaching on books other than the epistles of the New Testament. You are a foot soldier in the army of the church of the Lord Jesus alongside others. You seek to grow as a preacher. People will never hear all the Bible preached to them in a lively, vital, applicatory manner without sitting under a minister whose intention is to remain in that pulpit for as long as it takes to preach the whole of Scripture. There have been times of heartache and disappointment as well as joy and blessing in my time as joint-pastor. But I'd be quite content to stay here serving Lord's people at Providence & Ebenezer until I retire or they finally get fed up with my Welsh Rugby sermon illustrations and tell me to clear off. I was reminded that Andrew Davies' text for my induction service was Colossians 1:28 'Him we preach'. If nothing else, I have endeavoured to preach Christ from all the Scriptures. What greater work could there be? Well done, Guy. Press on, brother!